Lucas’s final result was 138th. The number itself is nothing to write home about, however did we accomplish what we set out to do? The answer is yes and much more. These last few days have shown me, and most importantly I think it has shown Lucas, that he can overcome adversity. He was thrown into the shark tank, and survived. He faced extreme new conditions he had never seen and learn from it, and adjusted as needed. The steep waves on day 2 of racing, combined with the strong wind posed a big challenged for him, but he tried to figured it out; he tried to “solve” the problem; as I always encourage him to do; but the highlight is that he did not quit any of the races, even after being swamped a few times and feeling “fear”, as he put it. We do look for mental toughness, and I think he forged some of it this week that will stay with him forever. 11 months. That is the number of months that Lucas has been sailing for. 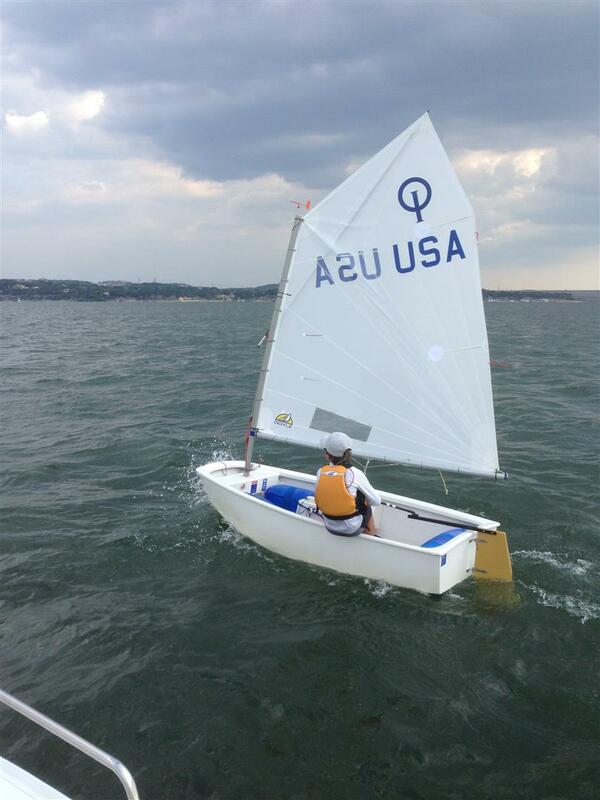 He started the Opti I program with coach Kate and Charlie in March of 2015. On May 5th, for his 10th birthday, we got him a club boat I purchased from Kate, and then it was literally off to the races. Capping that first year of Lucas’s sailing by competing in the advanced Optimist “Timoneles” fleet at the “Semana Internacional del Yachting” in Argentina, is an accomplishment that is even hard for me to comprehend. I am his dad, so I am bias of course, but I am impressed, and so yes we accomplished our “getting experience” objective, and as I said, much more. Thanks to the coordination and support from the AYC Fund, the RoadRunner Fleet, and AYC Sail Training over 20 Laser and Optimist sailors had an amazing weekend right here at Lake Travis. The weekend racing clinic launched Friday night with Fajitas and a chalk talk, followed by two full days of practice. When keel boats were aborting Saturday conditions the youth continued to sail. A total of eight hours on Saturday with reported maximum gusts of 33 kts. was just the right thing to prepare for upcoming regattas in Corpus Christi and San Francisco Bay. The learning continued Sunday under 10-15 winds allowing for attention to the finer details of how best to sail to maximum benefit. 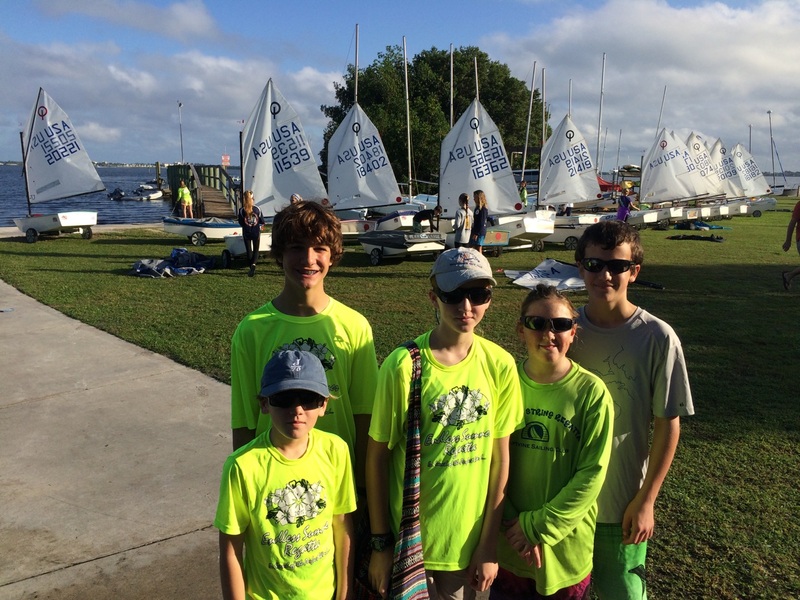 The Laser fleet was coached by our own Coach Coleman, and the Optimists were under the guidance of Coach Jamie Gilman of Lakewood Yacht Club. The Team Race Midwinter Championship at Lakewood Yacht Club in Houston was the largest ever with 32 teams from all over the nation on three different start lines. AYC brought two teams and gave it their best, sailing approximately 15 races each through rain, gust, calm, and current over the three-day event. This four-on-four exciting format allowed for strategic aggressiveness, and provided logical thinkers the chance to really execute a chess-game with offensive and defensive plays. If you would like to learn team racing, please contact Sportsmanship Chair Jeff Brock at jeffbrock@me.com. We are recruiting for the next team race event which is July 16-17 , quickly followed by another two-day event on July 24-26. Meanwhile, five other racing RoadRunners joined East Coast sailors, and spent a warm, humid week at the US Sailing Center in Marin County, Florida for a team racing clinic for 28 sailors from Florida, North Carolina, New York, Louisiana, and Austin. They hope to use their new knowledge and skill set in the upcoming USODA MidWinter Team Racng event in Lakewood later this month. Despite cool and dismal weather in Austin, you may have seen Lucas Tenrerrio sailing on Lake Travis nearly every day this month. 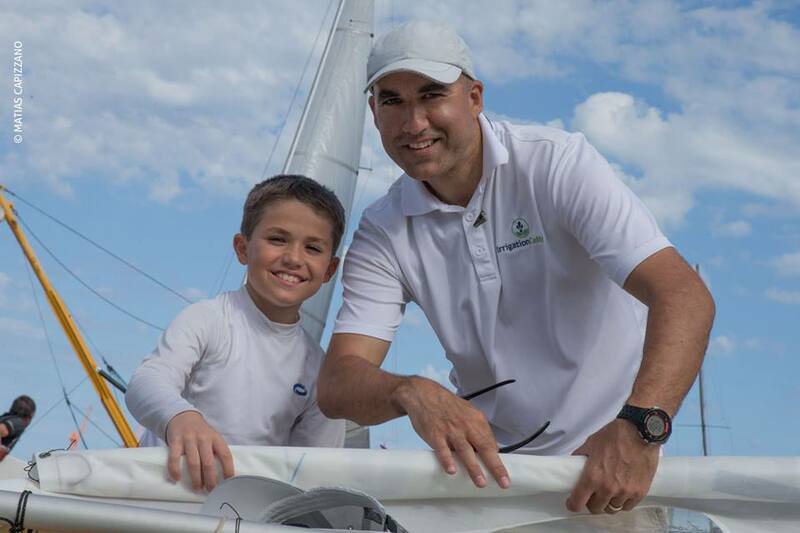 His dedication is impressive as he gears up to sail in his first international regatta at the Semana Internacional del Yachting de Mar del Plata, Argentina. This ISAF event will have starting lines for: Optimist, Laser, Cadet, 420, 29er, 49er, F18, Snipe, Kiteboarding and 2.4mr. It is guaranteed to be an amazing week of action. 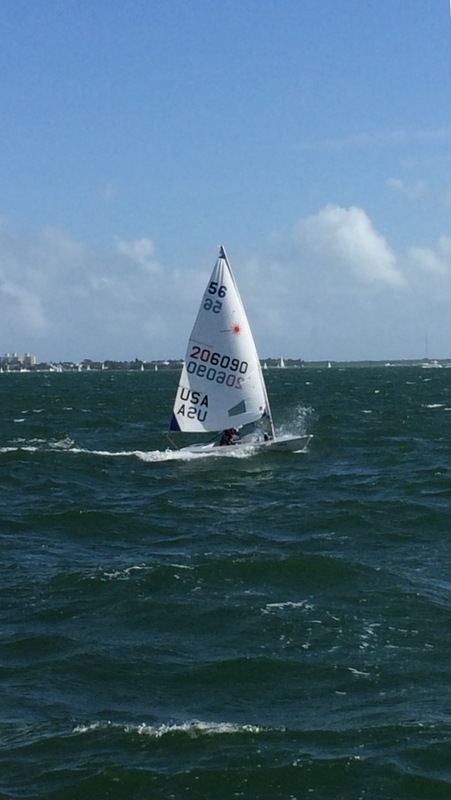 Sailing for Austin Yacht Club after 4 days of racing, 11 races in breezy conditions, and racing against 100 sailors in the laser radial division from all over the world were Alexandra Mares (42nd place) and Spencer LeGrande (25th place) at the Orange Bowl Regatta in Miami. Across all fleets, this is the largest regatta in the nation with over 625 participants. Way to represent! Late fees begin 3/2 & close 3/16 at 5pm. Tony – 2nd place blue fleet. Jamie first place white fleet. Spencer places second in Radial Fleet. Jules places 3rd in Laser Full! USODA Mid America Championship Begins! Eric earns Green Fleet third on his first travel regatta. Fiona starting to get some excellent spikes in performance. Tony excelling in the lead. Team AYC with Coach Kiel. Jamie: Gulf Coast White Fleet 3rd place. Jamie’s first ever bullet in a USODA event before any other Roadrunner! How many RoadRunners can you fit in a hotel room? Taking time out to tour around. Waiting for the O flag. Team AYC first to arrive – again! Played the windshifts well and earned a 14 in one of the races! Gulf Coast Green Fleet Champ. James breaks from the pack and places 2nd in White Fleet at the Spring Fling. Second place White Fleet, Jamie. AYC had three laser sailors at the Spring Fling. Good job Michael, Ben, and Spencer who placed 4th out of 15. Checking out the race course before the start. Exploring the course and conditions before race start. Julius receiving some real-time coaching. Rounding the windward mark in the top five! Her first ever number 5 overall in a RWB race! Girl Sailors read when not racing. Staying warm while waiting for the weather to clear. Tied at 63 points each….Tony wins the tie breaker….rematch in two weeks! The youngest racer in Texas pulled off a third place in one of her Saturday races. Jamie brings home 2nd Place White Fleet hardware for Team RRR! Coach Kiel demonstrating rudderless sailing. 2-day race clinic on a very cold weekend. AYC 1, 2, 3 !